Working for yourself can be a blessing and a curse, often both in any 24 hour period. Since quitting my job to focus on filmmaking (with the support of a couple of grants), I have been having a hard time structuring my day. Not such a problem, except when I forget to eat lunch. This week, I forced myself away from all the distractions to eat and plan. 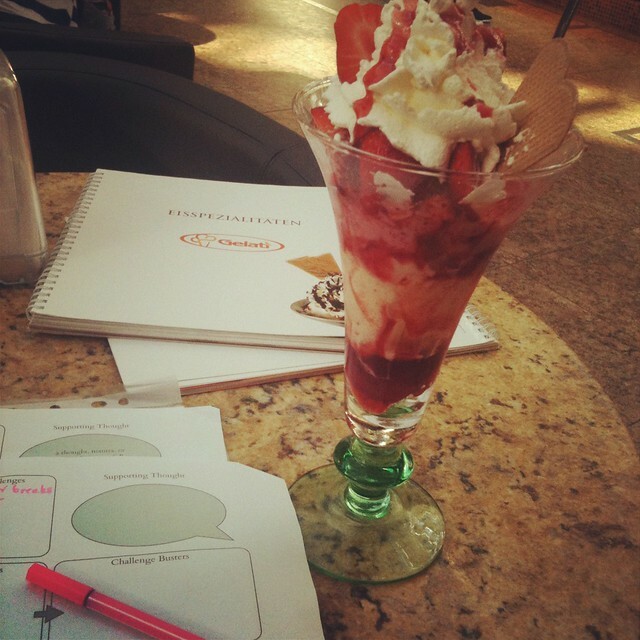 A strawberry sundae may not be the most healthy meal, but it put me in a great mood. Create As Folk (http://createasfolk.com/) has this great, free tool to help you reflect on your last month's successes and challenges so that you can track what works for you and implement it this month. I love the "48 hours goals" section, which keeps you from just filing the thing out and filing it. Take away from June 2012: if meet your deadlines, it doesn't matter how much time you spend daydreaming in the shade. Great post. You should really look at enhancing your social media credibility. If we can be of help feel free to check us out.